Posted on 21 September 2011, in Family, maine, Restaurants and tagged anniversary, hugo's, maine, Portland. Bookmark the permalink. 11 Comments. I wish you guys many many years of happiness, togetherness, flavors and aromas :) Love. Happy Anniversary!! I like how you celebrated – by eating, but not just eating… savoring a unique culinary experience. How perfect! I wish you many many more as the years just get better. Betsy and Howard, congrats on your 20th anniversary! I would also add that each of you has culinary specialties – Howard with the grilling and smoking and the sou vide, and you with the soups, mains, sides, and incredible baking. Your nice big kitchen reflects that there are two cooks who live, work, and eat there side-by-side. The Hugo’s dinner sounds intriguing. I think Richard and I will be more predictable for our anniversary coming up, and eat at Harvest in Cambridge. We have logged some good anniversary dinners there, and had a particularly memorable meal there last year. Plus, it’s a short drive! Happy Anniversary Betsy and Howard! I have to say, seeing the menu, the only thing I would have LOVED was the banana cake! Tim and I will celebrate 20 years married in November – guess 1991 was a fabulous year for love!! Sounds sort of like our Volt meal with a million ingredients. Question is, did you memorize those ingredients or write them down? Ha ha! It was similar to Volt but different. The voltaggios must have spent time at the French laundry too. I didn’t memorize. They brought us a menu at the end of the meal. The menu at Hugo’s definitely seems worthy of such a milestone celebration! I was chuckling when I read about your rocky first year…memories! :) I agree that if you can get through the hard times and if you work together well as a team – you can get through anything. 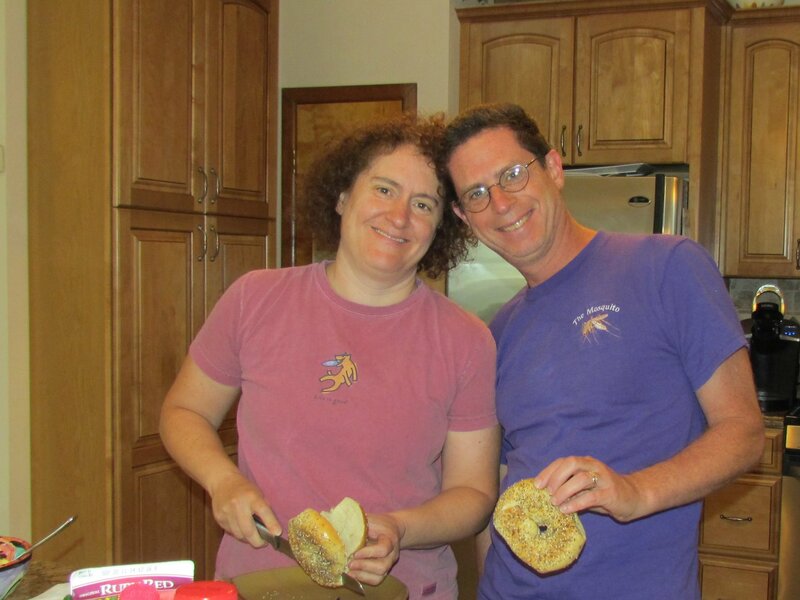 I love the picture of the two of you in the kitchen because from reading your blog it seems like you and Howard share a passion for food and cooking. Happy 20th and here’s to 20+ more! Congrats on 20 years of marrage! My husband and I will celebrate 4 years of marrage tomorrow, and we could only be so lucky to see 20 together. What a nice anniversary celebration! Happy Anniversary Betsy (and Howard)–glad you had a fittingly great celebration! Happy Anniversary! Both your celebration meals sound wonderful.